Absolutely outstanding! Originally written after the release of the movie Aliens this series continues the plot taking place some years after the movie's end concentrating on the characters Newt, Hicks and Bishop. 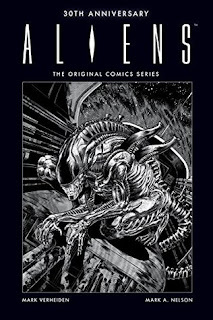 This was considered part of Alien canon until the release of Alien 3, this now being the first time this original series has been reprinted. It's a fascinating story and an interesting look back now as an alternate history in the Alien saga. The black and white artwork is gorgeous and as described, in both the introduction and afterword, is done in a technique no longer used since the advent of digital illustration. Such exceptionally gorgeous art that made me enjoy looking at the book as much as reading it. A must have for Alien fandom. Contains issues #1-6 plus Dark Horse Presents #24.